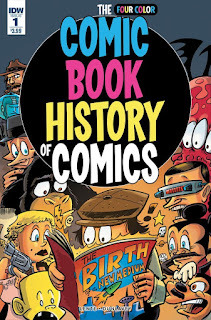 The Fellowship was fortunate enough to obtain a copy of THE COMIC BOOK HISTORY OF COMICS #1 from IDW Publishing. Fred Van Lente writes and letters, Ryan Dunlavey draws, and Adam Guzowski colors. The creators of Action Philosophers are back, and this time they’re tackling the long and storied history of comics. This issue starts at the beginning (a good idea), with the start of newspaper comics in the US in the late 19th century. We learn about yellow journalism, Nell Brinkley, and the origins of animation. And that’s just barely scratching the surface. There’s also a page on cave paintings, so the story really starts before the beginning. And that also gives the reader an idea of how detailed and carefully treated this history is. The main concepts are well explained within the constraints of having to fit so much into a small space. And the art plays just as integral a role in showing the different and varying pieces of history as the words do. This just wouldn’t work without the seamless combination of concise facts and carefully rendered drawings. Yes, I’m a bit of a history nut. But this is really cool reading anyway. History is more than just facts – presentation is just as important to make the material easy to absorb. And this book does it well. Pick it up and learn something. THE COMIC BOOK HISTORY OF COMICS #1 is available now at your FLCS or at idwpublishing.com.